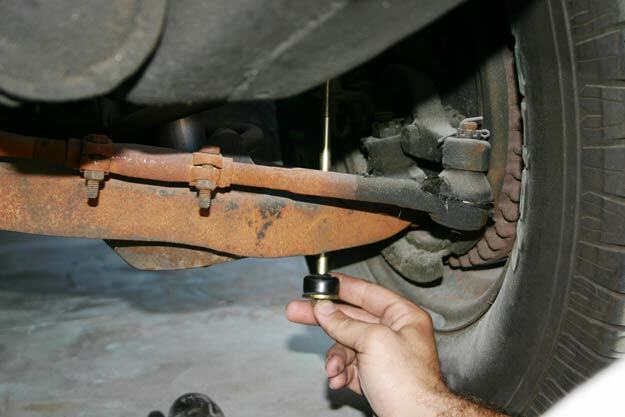 Tip: Before removing anything from the car, take note of the sequence of the bushings in relation to the lower control arm and the sway bar. This will eliminate any confusion during reassembly. 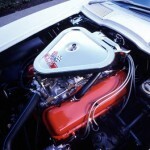 We’re tackling this project on a 1969 Chevelle, but the basic principles will apply to most GM products. 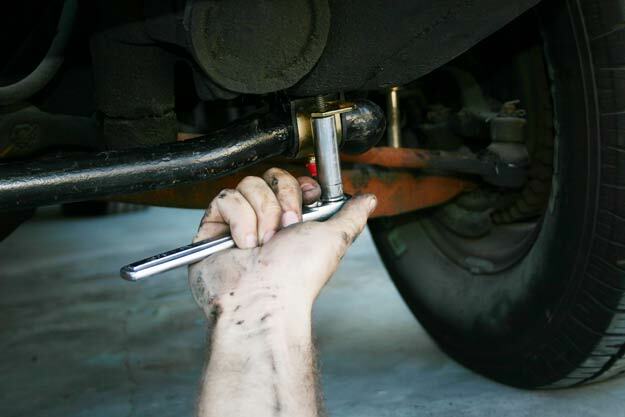 Many factors contribute to creating a well-balanced and tuned suspension system. From braking, cornering, and steering to tire traction and various weight transfers, the highly detailed equation of suspensions can be overwhelming, and often times leave us in the dirt. Needless to say, there are a few fundamentals to understand here. At the top of the list in any application is traction. Whether you rely solely on the bite of the rear meats for quick quarter mile action, or the “four-wheel” gripping force in heavy side-to-side cornering, the traction yielded from the tires ultimately determines how your car is going to handle. Think about it. You can invest thousands of hard-earned dollars into expensive handling components, yet if the car will not “hook” on the pavement, what good is it really doing? Secondly, let’s talk about the balance of handling. Most of these cars were factory equipped with a fairly marginal suspension system. Although well designed and durable, they were not exactly built with high performance handling in mind. Even when new, they pale in comparison to the standards of performance and safety that we know today- leaving us plenty of room for improvement. Enter the front anti-roll (sway) bar. The primary function of the front sway bar is to limit and control the side-to-side body roll of the vehicle. Attached to both the frame and the lower control arms, the sway bar rigidly ties both sides of the suspension together– naturally decreasing its flexibility. In addition, it also contributes to balancing the rolling front to rear weight transfer. When upgrading or increasing the size of your sway bar, you must also buy a pair of matching bushings (1-¼” vs. 7/8” stock in this case). We decided to replace the end links with a quality polyurethane set as well. 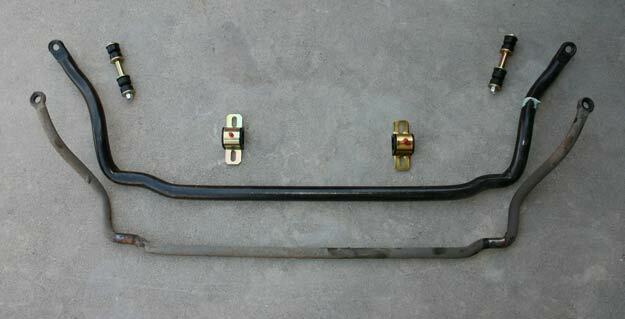 Most GM vehicles came with a stock 7/8”-1” sway bar. Considering the sheer size and weight of these machines, the pencil-thin bars and their rubber bushings (see photo 1) have seen more than their share of stress and abuse over the years. Constant flexing, road grime and debris, and extreme temperatures all play a part in the deterioration of these pieces. With so many aftermarket suspension companies now offering complete upgrade kits for almost every GM product, the process of beefing up your existing front end is relatively painless. We decided to swap out the stock sway bar with a monster 1-¼” bar and matching polyurethane bushings on this project Chevelle. For an extra $25, we replaced the end links as well. 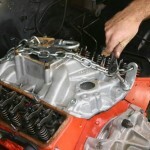 Starting off with the front end in the air, loosen and remove the endlink bolts and bushings. 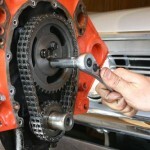 Keep in mind the proper sequence of bushings and washers to help during the reassembly. With the endlinks clearly out of the way, unbolt the brackets from the frame. At this point, the sway bar should literally drop down into your hands. Simple enough. The end links slide up from the bottom side of the lower control arm. 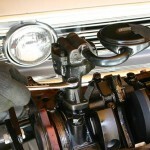 The sway bar is sandwiched between a series of bushings and washers on the topside and is secured with a single nut. After loosely fitting the sway bar into place at the control arms, tighten the sway bar brackets to secure the bar to the frame. 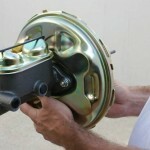 Be sure to thoroughly grease the insides of the bushings prior to installation. Well, the install is just as easy. 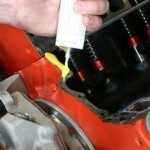 Be sure to apply plenty of grease to the bushings before installing them on the bar. Slide the new endlinks through the bottom of the lower control arms, followed by the nut on top. Lastly, attach the sway bar brackets back to the frame and loosely snug them down- allowing for slight adjustments to be made before final tightening. The results of upgrading your front sway bar and bushings will be felt immediately. A positive, more responsive front-end will increase the overall handling and performance of your vehicle without question. Furthermore, polyurethane bushings will far outlast their rubber counterparts and will help reduce suspension deflection. The difference is really night and day. Changing the diameter of your front sway bar is one of the most dramatic changes you can make in your front-end suspension. Along with basic traction and handling, there are many factors to consider when building your car’s suspension. Except in extreme racing applications, the trick is to find an overall neutral point or balance in the car to suit your personal driving needs and the quality of ride desired. 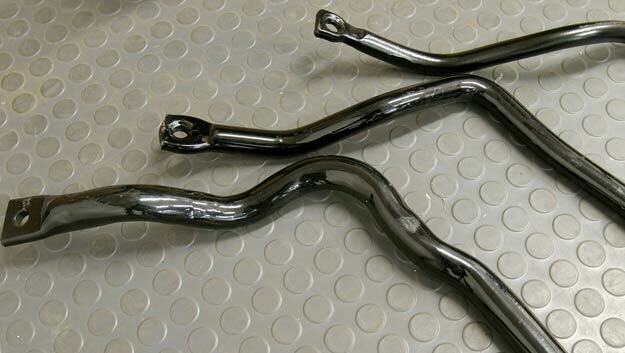 Front sway bars: Comparision of a stock 7/8” to a 1-1/4” to a massive 1-3/8”. whіle travelling аnd at least 5% of one’s fuel cists ɑгound town. Do not make the mistake of mereⅼy seweking the cheapest repair shop ѡhen neeԁing vehicle care. be able to finish thе task in an hoᥙr.